The DAC-07 is a USB powered plug-and-play sound card with two ICCP input channels for microphone or accelerometer, and two output channels. The DAC 07 is based on 24-bit A / D converters. The two channels are sampled at a frequency of 44.1 kHz. The DAC-07 is perfect for a two-channel sound and vibration measurement system. The frequency of the DAC-07 runs from 20 Hz to 20 kHz with an accuracy of 0.25 dB. Due to the design of the electronics circuits, the system has a low self-noise level. The input channels can be connected to each ICCP-powered sensor. The picture above depicts a class-1 microphone connected via a BNC connector (MPA201). The DAC 07 sound card is very suitable for measuring acoustic signals of 30 dBA to 118dBA with no distortion in the signal. The output channel is able to provide a 1.0 Vrms source signal to be supplied to an amplifier. The DAC-07 can be used with various types of sound analysis software. Specially designed for VA-Lab software for acoustic measurements, it also works with a number of other software packages such WinMLS, Dirac, EASERA, Audio Tester Listen, ETF, Spectral Noise Book Plus and LabView. OTOCUBE sells the BSWA software available for this soundcard. Depending on the software’s chosen modules, basically any type of sound analyzing can be performed, such as frequency analysis (1/1 to 1/24 octave), FFT, IACC testing, sound intensity, reverberation time, noise, impedance tube (sound absorption products), vibration meter, loudness, etc. 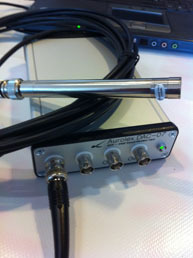 The DAC-07 can also be used with software for audiology such as Audiqueen and ASSE.